The number of Star Wars videogames that have been produced over the years is astronomical. In fact, by the time this article is published, thirteen more Star Wars games will be released. Ok, perhaps that is a slight exaggeration, but it is almost true considering that the latest Star Wars licensed title, Kinect Star Wars, hit store shelves around the world just this week. It displays the enduring popularity of the film saga that begun in 1977 and developed into a worldwide phenomenon. There have been many great Star Wars titles, such as the Dark Forces and Jedi Knight first-person shooter series, the Super Star Wars trilogy on Super Nintendo and the more recent Knights of the Old Republic titles. On the other hand, there has also been a near-endless stream of dross. Rushed film tie-ins for the prequel trilogy and insane spin-offs like the robot-building Star Wars: Droid Works and the windows-based Yoda Stories were less well-received. One of the best-remembered entries in the long list is the Star Wars Arcade game from Atari in 1983. It was a Vector graphics first-person space simulator and saw you piloting an X-Wing in the final attack on the Death Star from the first Star Wars film. the title is a classic and is still played today by retro gamers. 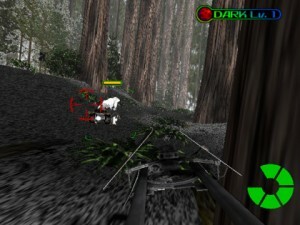 The game was also ported to many home computers of the time, and as such is probably one of the widest played Star Wars games ever made. Two sequels were later produced, but neither quite captured the feeling of the film as well as the first. 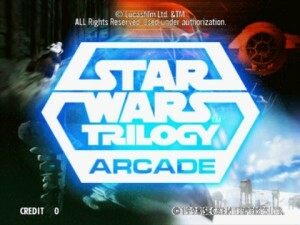 The star Wars Trilogy title we are going to look at today is the one released in arcades in 1998 by SEGA. The game never saw a home release, despite many of the SEGA arcade titles of the time appearing on the Dreamcast; which was a great shame. Taking its cue somewhat from the Atari original, the game sees you re-creating the most famous battles from each film; of course beginning with the Death Star battle from A New Hope. Also, in a similar way to the Atari game, the arcade cabinet came both in an upright and sit-down configuration, both of which looked similar in design, with a joystick for control. the cabinets also featured surround sound speakers, so that all of the iconic music and sound effects fro the film series could be re-created to dramatic effect whilst playing. Released in time to tie-in with the Special Edition re-releases of the original trilogy, the game rode the renewed interest in the ageing Sci-Fi classic and made gamers feel like they were right in the middle of the movies. 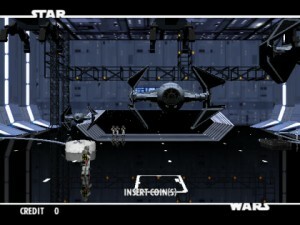 The game is an on-rails shooter, in essence, with some variety in the stages providing a bit of innovation that made it stand out from other Star Wars flight sims of the time. Each film was represented with a couple of different stages, which were all kept fairly unique so that the game didn’t get too repetitive or stale. In Episode IV: A New Hope, gamers first control Luke Skywalker in his X-Wing as he battles Tie Fighters in space above the Death Star. The second stage of this film featured the iconic Death Star Trench run, where you have to implement precision timing to “Use the Force” and successfully destroy the super-weapon. For The Empire Strikes Back, players jump right in where the film begins; on Hoth. Piloting a snowspeeder, you will take down AT-ST walkers and probe droids whilst helping your squad mates to use grappling hooks and trip up the gigantic AT-AT walkers. In the second part of this movie we see the first non-vehicle stage in the game, where you must escape the Rebel bunker. In your attempts to escape, you will shoot many snowtroopers and wampa beasts in an on-rails shooter very similar to one of the House of the Dead titles. Finally, in Return of the Jedi, we first head to Endor where gamers ride a Speeder Bike through the forests, before again heading out on foot to reach the Empire bunker and destroy the shields. 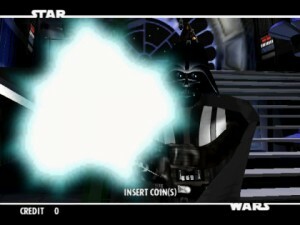 For completing all of the main missions, the player gains access to the final conclusive battle, as they once again take control of an X-Wing fighter to destroy the second Death Star, in a scene taken from the end of Return of the Jedi. This wasn’t all of the content players got access to. 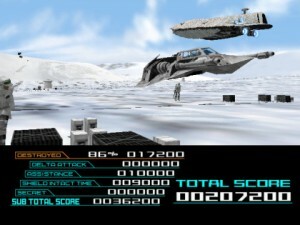 players could attempt any of the movie stages in the order they so chose, and between each successfully completed film they would be granted a bonus stage. The first involved a battle with Boba Fett above the Sarlacc Pit near Jabba’s Palace. The second was a one-on-one duel with Darth Vader on the second Death Star, unfortunately without the Emperor joining in with his Force Lightning powers. These were both Lightsaber duels, where the player used the joystick as if it were the handle of their Lightsaber. It felt great getting to play these iconic moments simply as bonus levels, and getting to use the Lightsaber was a dream for all gamers. You could deflect blaster shots by Boba Fett, just like Luke Skywalker, and the duel with Darth Vader was tense and atmospheric, just like in the film. There was also the option to use the Special Event buttons on the joystick. These would only light up at specific points in the game, but if pressed at the correct time would trigger a bonus event or special targets to appear. The controls were precise and you felt some feedback through the joystick so it really felt gratifying when you score a Lightsaber hit or when you fire off a barrage of torpedoes. Whether controlling a space ship in a dogfight or aiming the crosshairs of your blaster as Han Solo when on foot, the control system worked well across all gameplay formats. It must be said that the graphics were also very impressive for the time. SEGA arcade titles were always quite super-powered graphically, but the game was able to re-create iconic Star Wars moments like no other title before it; especially during the ground-base missions, where more detail and close-up enemies and textures were called for. The music and sound was great because, as previously mentioned, surround sound was employed, and when walking through an arcade the machine really made you want to stop and see what was going on. It was one of those machines that beckoned to players with its booming sound and top-notch presentation. The look, feel and sound of the films was lovingly translated into this frantic shooter. Of course, being a SEGA arcade title, the game was pretty darned difficult, and involved quite a lot of twitch shooting moments where your reflexes would really have to be on top of their game so as not to lose energy. Thankfully you were supplied with a circular energy bar, so players could survive around six hits before they would die. This also directly mirrored the Atari Star Wars game where your X-Wing had six shield units that acted as energy, and when depleted it was game over. There were also power-ups littered around the levels that could reward gamers with extra energy, or players could have their life replenished between stages by attaining high scores. The fact that you could choose the order in which you tackled the levels did mean that even if you weren’t the best at the game, you could still try your hand at all of the different films without having to complete them in order, which is still a somewhat rare thing in gaming. 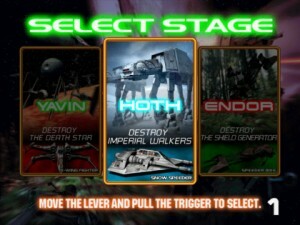 It may not have been a revolutionary game, with its gameplay being borrowed from many titles that came before it, but Star Wars Trilogy Arcade did provide a fun and intense arcade experience, that really thrust you into the middle of the epic Sci-Fi saga unlike any other games had managed in the past. Star Wars Trilogy Arcade can still be found in selected arcades around the country if you are lucky. Kinect Star Wars launched on April 3rd, and you can see the GodisaGeek.com review here. The God is a Geek Retro Corner is part of “Feature Friday” and will return on the first Friday of next month. 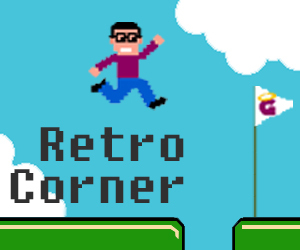 You can see previous entries into the GodisaGeek Retro Corner by clicking here.